Good morning friends, today is Day of Giving Friday. 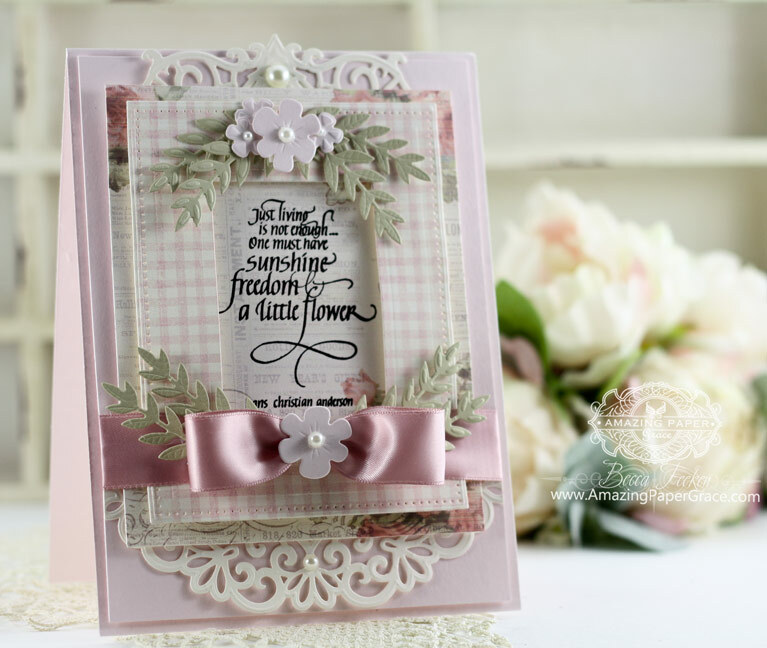 I have new card to giveaway today and I simply love, love, love the pretty sentiment by Quietfire Design. I was playing around with a new set of dies Spellbinders Floral Berry Accents and the tiny little accent flowers sent me off looking for a sentiment that referenced flowers . . . check! The card base is 5-1/2 x 7-1/2. On top of my card base I added a panel 5-1/4″ x 7-1/4″. Next I added another panel to stamp my sentiment on sized 4-5/8″ x 5-7/8″ and underneath the panel I added Spellbinders Heirloom Oval cut in half and Spellbinders Deco Duality trimmed to be the header piece. Next I added a frame cut with Spellbinders Pierced Rectangles. I finished up with Spellbinders Floral Berry Accents using the single foliage pieces and the separate cluster of flowers. I finished up with a simple one loop bow and several pearls for flower centers. For new readers, every Friday it’s my pleasure to give away a card. The card goes to a randomly picked reader (worldwide) who leaves a comment in our conversation. Want to know more about Day of Giving, here’s a link to my FAQ’s just check out #11. You can check to see if your name is on the list of winners HERE. For your comment: How much does coloring fit into your cardmaking and scrapbooking activities? Thanks so much for checking on me. As I mentioned, I am back home and yesterday the Dr. said I can try to start walking on my foot again. It will take a while – I’ll go slow but I’m a happy little camper right now. Becca love the pink gingham with the white, very crisp and that lovely little flower goes so well with the sentiment. I am not that good with computing but always willing to learn, and try. I think it adds to the card when done properly. Such a sweet card. I really like the gingham…it really sets off the verse well, I think. As always, your choice of materials always works well together. So glad you get to start walking again. Just remember, those muscles and bones and nerves have been all padded and tucked safely away from any movement and stress and have been quite spoiled for a while. They may complain loudly at having to work again! Be gentle with yourself and stay ahead of the pain! Coloring is always part of the design for me…I’m working on designing a stand up card for our pianist/choir director at church wh is leaving in a few weeks. The card will be from our choir, and the part that will be the base to hold the back that will stand up will be a keyboard. The “stand up” portion will be a music stand with sheet music in it. So the color of the stand, the aged sheet music, and how I finish off the inside will all be important for the overall look for the card. Some fade into the background music notes, as it will be a large card, in order to get everyone’s good wishes on it on the inside, to add interest, I think. Still working it out in my head, but I want it to be something he will appreciate and reflect his love of jazz and church music, and his time with us. I am just starting to have a real go at it and I am enjoying doing it . And yet another gorgeous card Becca, and such a wonderful sentiment, and even by one of my famous countrymen too, which just makes it even better ofcause ha ha. 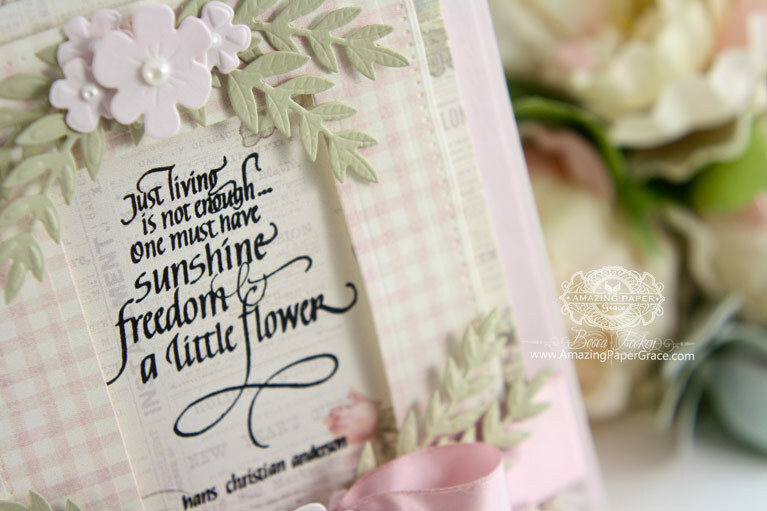 The card is sooo sweet and beautiful, and I really love the beautiful little flowers here. Wonderful news about your foot, no wonder, you´re such a happy camper now, who wouldn´t be? Hopefully you´ll soon be all back to the good times again now, I sure hope so for you. Morning Becca, Another stunning card, I love the fresh look to this card and the beautiful die-cuts used, stunning !! So glad you are getting better. I want to start doing more stamping and colouring and really need the time to ‘play’ more haha. What a beautiful way to end the week! I just plain ADORE this card! I cannot tell you the extent of emotion I am feeling with that sentiment. Coloring has become a daily activity lately. I do it while watching tv in the evening, during the day when I need to check out but not nap or just need a moment to myself. I am so glad all the wonderful coloring books & pages have returned. Beautiful Becca, as always. Hope you are improving health wise & as good as new. I used to always color but not so much now with more in paper arts. I like to use watercolor on my cards. Sometimes as a base, sometimes for the sentiment. Gives such a pretty look. Oh what a lovely, delicate card Becca. The pink and white gingham paper is perfect. The bow is simple but beautiful. Super sweet card today, Becca. So feminine! You just can’t go wrong with pink and lace and ribbon! This is another lovely one! I color on over 50% of my cards. At first I tried to avoid coloring, but now I like it. So glad to hear you are coming along nicely but don’t over due yourself. I don’t do a lot of coloring. I have recently started coloring with pencils and I’m really enjoying it. I’m just coloring no blending and all that. Beautiful and sweet card Becca. As always you do an amazing job with your cards!!! I do stamp….have over 100 pizza boxes full of stamps – LOL), BUT, I enjoy die cutting and shaping and layering MUCH more than the stamping! I’m kind of newbie with coloring…so I don’t do a lot of it on my kinds yet, but I’ll really enjoy seeing colored cards! May the Lord strength you sister!! Take things easy and try to rest and not overdo it. Your card today is beautiful, as usual. Colouring is ALWAYS in my paper craft, whether cards or scrapbooking as I love stamping and colouring in many different mediums. What good news to hear you’re healing nicely. What sweet flowers on your card. Color makes paper crafting so much fun! I love matching and harmonizing color-it makes my card making a time of play. Brilliant news! But take it steady as you start to use your foot again. It is surprising how quickly muscles and joints get used to the lack of movement! Such a pretty card and I love the gingham. Another beautiful card Becca – colouring is (nearly) always on my cards – love adding my own touch and interpretation of the images. Another Simple but elegant card. As always love the sentiment and working on building my sentiment stamp collection. The Quitefire Designs sentiment stamps really speak to me. Wish I had started sooner with them, missed alot of them that are now discontinued. But might be able to find them thru other sources. As for coloring. It depends on my choice of stamp. Enjoy throwing in a water color now and again, but really depends on my card choice and the recipent. Tend to use colors when making cards for my granddaughters, but for most of the older crowd like me not so much. Love the card today and hope I will be able to win one of your cards someday. Glad you are doing better and try a little walking. I bet it was exciting to get that good news. Good morning Becca, glad to hear you’re on the mend just take it easy!!! 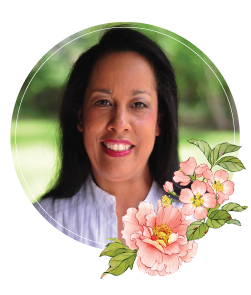 Your card today is gorgeous and the gingham is so clean and fresh!!! Colour is important and I try to match the colour to the person receiving the card!!! Sweet card! Love the layers and details! Your card today is so lovely and I also love the sentiment. Quiet Fire has such beautiful stamps and you use them so well on your fabulous cards! Love the gingham paper too. I’m glad you’ve gotten the okay to begin walking again. Having had foot surgery myself, I understand how encouraging it is to reach those recovery milestones. Best wishes to you always!